A looping slitter is the most common slitter for slitting of light gauge materials and narrow widths (also known as mults). 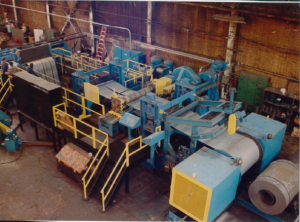 The materials are typically looped into a pit after the slitter, allowing for accumulation of the mults. With the material accumulation in the loop allows for maintaining constant tension across all mults at the recoiler. In this setup, the entry section and slitter are over sped to create the loop and then synchronized to the recoiler speed. Element has supplied many loop-type slitters, these machines involve deep pit installed in the foundation between the slitter and recoiler assemblies. This pit allows for progagation and accumulation of the mult length differentials. The use of an adjustable tension stand in front of the recoiler assembly, allows for uniformly wound slit coil under constant tension at the recoiler.